Dieter’s Green Tea contains ingredients to aid in the maintenance of one’s weight. 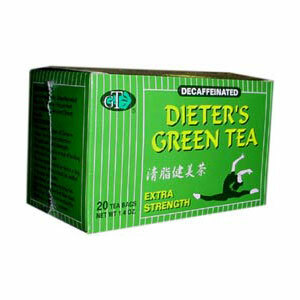 Dieter’s Green Tea contains ingredients to aid in the maintenance of one’s weight. Green Tea has been shown to have many health benefits when used continuously. This is due to the power of its constituents, which include carotenoids, chlorophyll, polysaccharides, fats, vitamins C and E, manganese, potassium and zinc. Green tea is regarded as an antioxidant. The polyphenols, especially EGCG, prevent free radical damage and have even been found to detoxify free radicals produced by the environment. Available in Regular Strength and Extra Strength. Cassia Angustifolia, Decaffeinated Green Tea, Papaya, Peppermint Leaf. Brew one tea bag in a cup of boiling water for 3 minutes. You may drink it once or twice a day after meals. Honey can be added to sweeten the taste. Extra bowel movements may be experienced for the first few days. Discontinue use if diarrhea or abdominal pain persists. This tea is not recommended for children or pregnant women.